A few days into the New Year and we already feel like we could do with a little pick-me-up. Fortunately, there’s always a coffee on the go at Test Pit Towers, and recently our favourite beverage has been made by something truly unique looking. The local supermarket’s shelves have been cleared of all Dolce Gusto pods once more, as we test the Drop coffee machine from Krups. 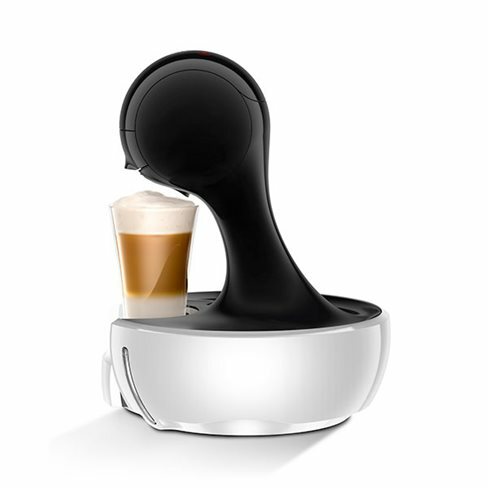 We’re not sure, but we think the Drop might be the fourth Dolce Gusto coffee machine we’ve tested. Surely by now you must know the deal, but for those uninitiated in the ways of convenient coffee, these machines take small pods which come in a variety of flavours and styles. All you have to do (as the discerning yet lazy coffee connoisseur) is pour in some water, set the indicator to the same number of bars as is printed on the pod, and hit the button. A delicious coffee will be yours in no time at all, sans mess. 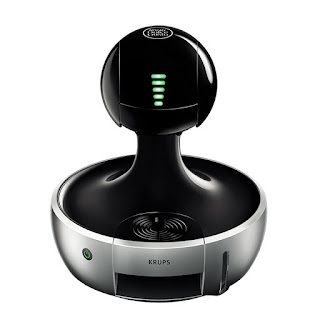 So we might be old hands at the Dolce Gusto game, but the Drop was something new. The machine itself is styled after a black liquid droplet of coffee leaping up into the air, and thanks to the shiny plastic surface this is achieved very well. 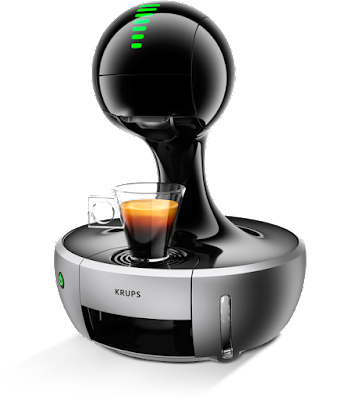 Unlike the De’Longhi Stelia Dolce Gusto machine that we reviewed last summer, Krups have fully integrated the water tank into the body of the machine, making it far more compact and counter space-saving. Fortunately, one feature of the Stelia that the Drop has retained is the touch-sensitive controls on top. Simply glide your finger across the ‘head’ section to illuminate the correct number of green bars, then tap either the cold or hot water button. As well as making the Drop look pretty flash and futuristic, the touch controls also make the whole thing seem much more minimal and clean – adding the liquid ‘drop’ looks. know how much is left. It's nice. The Krups Drop has a maximum pressure of 15 bar, meaning the likes of espresso, our own favourite tipple, comes out good and hot with plenty of crema. The machine itself ships with a nice little selection of pods for you to try, but there are loads available, including cappuccino and latte, as well as mochas and even teas (what!?!). There isn’t a great deal more we can say about the Drop, and to be honest that can only be a good thing. This is coffee making at its simplest and most user-friendly, and thanks the stylish design – by far the most eye-pleasing espresso machine we’ve ever tested – it is something people would actually enjoy just looking at.